MISSES' DRESS: Lined, sleeveless dress has darted, fitted bodice, dropped waistline, inside belt, neckline bands, gathered skirt and side zipper. A: below mid-knee length. B: floor length. Bellville Sassoon Lined, straight, fitted dress, above mid-knee length, has self-fabric piping at neckline, invisible zipper at right side with hook and eye strap opening. Below hip length foundation has boning. Front and back are pleated into left side seam, self-fabric bow at left side front. This wrap and tie knit dress for miss and miss plus can be tied in a variety of ways for different looks and styles that flatter any figure type. Dress can be made in two lengths. Simplicity sewing pattern. This classic 1950's vintage dress pattern for both miss and plus size is perfect for any special occasion. Dress has option of contrast bodice inset. Back of dress has V-neckline with bow. Simplicity sewing pattern. Mimi G has done it again with these gorgeous dresses featuring high cowl neck with tied bow halter. Pattern includes maxi dress with full skirt & low bodice back, knee length dress with option of high or low back & belt. Out Of Print This vintage 1950's special occasion dress for miss and miss petite is sure to be a head turner. Make with crossed straps and option of tulle overlay and belt or with bow straps. Simplicity sewing pattern. Misses' Sew Stylish dress can be made floor length with bodice and skirt overlays, knee length with straps, and sleeveless about the knee or high low with contrast yoke and skirt overlay. This Amazing Fit special occasion dress for miss and plus can be knee length with or without bodice overlay and floor length with complete lace overlay. Pattern includes separate pieces for B, C, D, and DD cup sizes. Description: Misses' Knit Dress, Tunic and Top Get creative felting this long sleeve dress, tunic and top with hoods for miss. Felting instructions included on guidesheet to help you make a truely unique garment. Karen Fleisch for Simplicity. This vintage sportswear pattern made for miss and miss petite features a short or three quarter sleeve dress with elbow and bust darts and back zipper. Pattern also includes unlined coat and unlined vest in two lengths. MISSES' DRESS: Lined dress has close-fitting, bias front, draped (overlapped front) bodice with stays, gathered skirt, and elasticized back casings and invisible zipper. FABRICS: Chiffon, Matte Jersey, Charmeuse. Unsuitable for obvious diagonals. MISSES' DRESS: Close-fitting, lined, mock wrap, pullover dress has collar, neckline, front and back (bias) tucks, overlapped and stitched left front, right side front and back seams, no side seams, and sleeves with stitched hems and cuffs hand tacked and fold-back. FABRICS: Two-Way Stretch Knits: Rayon/Spandex, Wool/Spandex. Lining: Tricot. Misses special occasion dresses by SUEDEsays with options for short strapless with sweetheart neckline & lace overlay, short dress with contrast straps, mermaid style dress with sheer overlay or hi lo mermaid with halter. Fabrics: A,B,C,D Dress Charmeuse, Crepe, Crepe Back Satin, Sateen, Satin, Taffeta. A Overdress and C Contrast Straps in Chiffon, Double Georgette, Organza. C,D Dress also in Pique. D Overdress in Novelty Scalloped Fabrics, Galloon Edge Lace. Misses' day or evening dress can be made with two figure flattering bodices. Dresses can be made long or short with princess seam bodice and square neck or faux wrap v neck bodice. Both have asymmetric cinch at waist. Fabrics: Batiks, Brocade, Challis, Crepe, Crepe Back Satin, Faille, Linen Types, Pique, Sateen, Satin. MISSES'DRESS: Lined dress has close-fitting, boned bodice with princess seams, foundation, semi-fitted skirt, left side front pleats, single-layer flounce, wrong side shows, high slit, invisible back zipper, and very narrow hem. FABRICS: Silk Crepe, Matte Jersey, Peau De Soie. Contrast: Charmeuse. Interfacing 1: Nylon Fusible Knit. Unsuitable for obvious diagonals. MISSES' DRESS: Close-fitting, lined dress has pleated upper front, boned upper left side, upper right front extending into upper right back, no shoulder seam, side front and side back seams, elasticized upper edge of left side, right back drape extending into upper left back, and invisible back zipper. Note: no provisions provided for above waist adjustment. FABRICS: Two-Way Stretch Knits, Sequin Mesh, Stretch Velvet. Lining: Rayon/Spandex. MISSES' DRESS AND BELT: Lined dress has close-fitting bodice with princess seams, pleated skirt (guide), side pockets, back zipper and thread loops for self belt. FABRICS: Faille, Shantung, Satin, Poplin. MISSES' DRESS: Lined dress (cut on crosswise grain) has close-fitting, underlined bodice and midriff, plunging V-neckline, long sleeves, double-lined skirt, hem ruffle, and exposed back zipper. Purchased trim. FABRICS: Two-way Stretch Fabrics: Scalloped-Edge Stretch Lace. Underlining/Lining: Tricot. *With Nap. NOTIONS: 22" Metal Zipper, 1 yd. of 7/8" Grosgrain Ribbon. 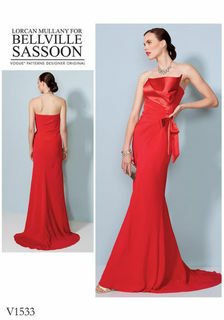 MISSES' DRESS: Bias, sleeveless, floor-length dress has V-neckline, close-fitting, self-lined bodice and midriff. Skirt left-back extending into pleated drape, wrong side shows, concealed invisible back zipper, and hemline slit. Very narrow hem finish. FABRICS: Crepe Back Satin, 4-Ply Crepe, Silk Jersey and Crepe de Chine. *With Nap. **Without Nap. Unsuitable for obvious diagonals. NOTIONS: 7" Invisible Zipper, Hook & Eye Closure and Two Snaps. MISSES' DRESS: Close-fitting, long-sleeve, floor-length, lined dress has ruched collar and right side-front, left yoke, back extending into train, continuous bias for neckline piping and armhole binding, and invisible back zipper. Note: No provisions provided for above and below waist adjustments. FABRICS: Moderate Stretch Knits: Stretch Lace, Sequin Mesh, Stretch Velvet, ITY Knits. Lining 1: Tricot. Lining 2: Lining Fabric. *With Nap. **Without Nap. Unsuitable for obvious diagonals. NOTIONS: 22" Invisible Zipper, 11/4 yds. of 1/16" Cording, Hook & Eye. 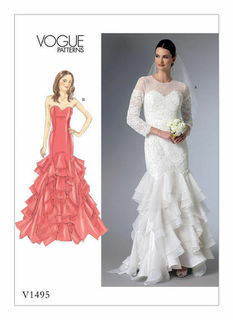 MISSES'/MISSES' PETITE SWEETHEART-NECKLINE GOWNS WITH FLOUNCES Close-fitting, underlined, lined dresses (fitted through hips) has princess seams, sweetheart neckline, boned/seamed foundation with hook & eye closing, skirt stays, flounces, flounce overlays, very narrow hem, and invisible back zipper. A: Overlays, self-lined yokes, three-quarter length sleeves and back button trim. B: Strapless. FABRICS: Organza, Peau de Soie, Organdy. Contrast 1: Beaded Double-Edge Scallop Lace. Contrast 2: Mesh. Underlining/Lining: Taffeta. Unsuitable for obvious diagonals. NOTIONS: A, B: 21/2 yds. (2.3 m) of Boning with Casing, 7 yds. (6.4 m) of 1" Horse Hair Braid. A: 22" (56 cm) Invisible Zipper, Thirty 3/8" (1 cm) Buttons to Cover, Seven Hooks & Eyes. B: 12" (31 cm) Invisible Zipper, Six Hooks & Eyes. 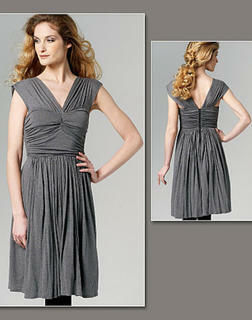 Close-fitting lined dress has deep cowl that may be draped as desired, front princess seams on bodice, and open back. FABRICS: Wool Crepe, Ponte Knit, Crepe-Back Satin. Lining, Binding, Drawstrings: Georgette, Crepe de Chine. Unsuitable for obvious diagonals. *With Nap. **Without Nap. NOTIONS: One 14" (36 cm) Invisible Zipper, One Hook & Eye, One Cordstop. Close-fitting lined strapless dress has bodice foundation and boning, sew in interfacing, and contrast front drape and bow. FABRICS: Crepe-Back Satin, Crepe, Peau de Soie. Interfacing: Medium-Weight Sew-In. Lining: China Silk. Unsuitable for obvious diagonals. *With Nap. **Without Nap. Close-fitting through the bodice, lined dress has halter neckline, full skirt and contrast bodice. 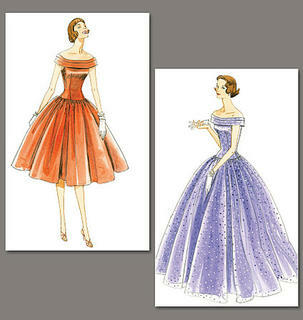 FABRICS: Faille, Satin, Shantung, Taffeta. Also for Contrast: Beaded Fabrics, Velvet. Unsuitable for obvious diagonals. *With Nap. **Without Nap. Close-fitting lined dress has side pleating and attached cape. FABRICS: Matte Jersey, Chiffon, Crepe de Chine, Georgette. Underlining, Lining: China Silk. Unsuitable for obvious diagonals. *With Nap. **Without Nap.